Take a step outside to your own personal tropical resort. 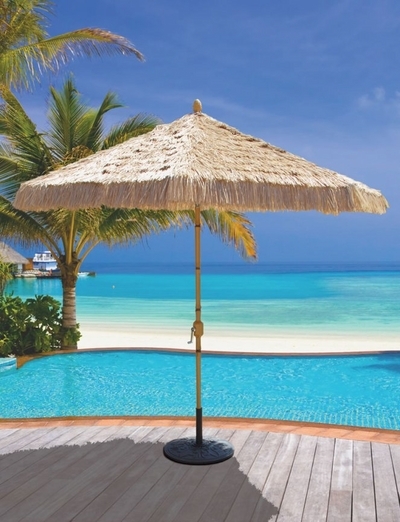 This popular Galtech 9-ft. Bamboo Deluxe Auto-Tilt Patio Umbrella provides you relief from the heat of the sun, all in a unique and fun style that includes a charming pineapple finial atop the umbrella. The all weather aluminum pole is hand-painted in a bamboo style, either in natural or java, and features knots just like the real thing! The deluxe auto-tilt feature delivers maximum sun protection by easily shifting your umbrella to any angle. You will fall in love with the faux-thatch canopy available in natural or java, sure to coordinate beautifully with any decor. Add this final touch to your open-air space for that luxurious touch of flair.